Woo Hoo!!! It's hop time!!! them you are right on track, if not then you might want to over and start at the begining!! It's Ella, the Pink Elephant's 1st Birthday and we are doing a blog hop to celebrate. The theme of the hop was to pick our favorite TPE Challenge of 2009 and recreate it!! which challenges us to use our favorite Color Medium. I used one of my favorite Mo Digis! Blog!! She makes very pretty cards, I wonder what her favorite challenge was?!?!? Be sure to leave a comment for your chance to win!! This is so cute! I love this Mo's image as well! I love the colors you chose! Great card! I, too, love colouring with Copics! Hi Hannah! You did a fantastic job on this card. Your coloring is gorgeous and the colors are fun! This is adorable! I love the color combo and that's such a wonderful image! Love that digi and your coloring is great. OMG Hannah this is gorgeous love the colors combo you used and that image is just so sweet. I just looove your cards, so bright and cheery! This one is adorable and your colouring is fantastic!!! 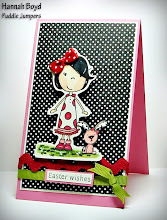 Love those color combos, what a darling card! Thanks for the fun hop. Super cute cards! You color so beautifully with your Copics. They are my favs too! Gorgeous card! That image is too cute! Love your card, such pretty colors. Mo's digi are just the best! Beautiful coluring! Beautiful card Hannah!!! If I could learn to use my copics half as good as you do, I will be so excited! How adorable! Great that you got to pick two of your faves to combine!! Super cute and your coloring is fab! Sweetie you did good as usual! Love your colors! What a cute card Hannah! You do an amazing job with your coloring. Hannah, this is adorable!! I love the colors and darling image!! I love copics too!! And it's a fabu card!! Oh yeah, that was a fun one... I also have Mo`s digis as a favourite... You made a great card!! Very cute. I love the colors that you used. What a great challenge and super sweet card!! Love Danielle and Muffin. What pretty colors you used on the card. Very nice. I love this card, great colors! Love your card! The colours are fabulous and the image is adorable! I can see why it's your favourite, look at the gorgeous card you have created with it! The colours are absolutely fabulous! Oooh this card is adorable!! Your colouring with copics is fabulous! Great colors, and a very cute image! Thanks for sharing! What a precious card! I love the layout, the image, the embossing, but WOW! Your coloring is OUTSTANDING!!! 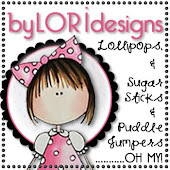 Oh Sweetie...your card is simply beautiful...Just like you!!! Beautiful card. This Mo's image is so cute. your image is just darling!!! I adore your coloring and the fun fun fun papers. That embossing is so sweet. Happy Birthday TPE!!! OMG, love your coloring. And that image is so so cute. Cute card love the colour combo used! I don't usually do much stamping and colouring. So lovely to see your card, it makes me want to start. Beautiful Colors! Beautiful Card! I can see why it is one of your favorites! so cute card! pretty colors! Absolutely gorgeous. Love the colours and the bold choice of colours for the image plus how you cut it out. Digital memory is something that I seem to be unable to ever have enough of. It's as if megabytes and gigabytes have become an inseparable part of my every day existence. Ever since I bought a Micro SD Card for my Nintendo DS flash card, I've been constantly vigilant for large memory at low prices. It's driving me crazy. 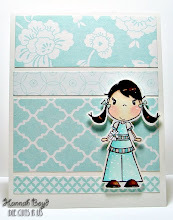 Pretty card....love the colors you used! Hannah...this card is just adorable. I love the colors you chose and your coloring looks fantastic! such a stunning card Hannah.....great colors and fab colouring! Love it! WOW! Beautiful card, Hannah!! Great Job!! Adorable Hannah! I love the red hair!!! Your card is gorgeous - I love the colorcombo and your coloring is fab! Hannah - your coloring is superb! Beautiful card! What I cute card Hannah!! Amazing card! Love it, what a great stamp. Your embossing is the perfect touch!